Something new will arrive soon at your local Orthodox Presbyterian church. 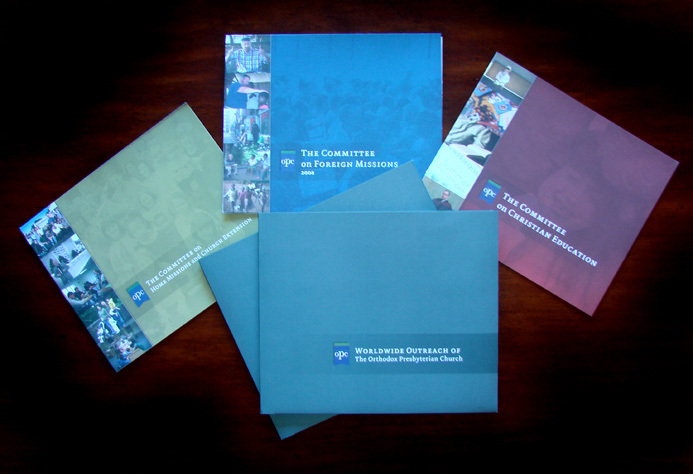 A group of colorful and informative materials prepared by the Worldwide Outreach (WWO) committees of the OPC—Home Missions, Foreign Missions, and Christian Education—is being sent to each OP congregation to explain how your denomination implements the Great Commission of our Lord Jesus Christ. The materials were prepared at the request of the 73rd General Assembly (GA) of the OPC, which urged that a better job should be done of telling the wonderful things God is doing in carrying out the Great Commission through our efforts. They also asked that some way be found to better explain the wonderfully biblical concept of Worldwide Outreach. Open the 8"X10" envelope titled simply "Worldwide Outreach in the Orthodox Presbyterian Church" and you'll immediately start to discover how unique and special the concept of Worldwide Outreach is. The WWO brochure is actually an envelope designed for two purposes. First, it explains how WWO works. Second, it holds the brochures of each of the three "program" committees that do the work. It's all about the unity of the church. "The OPC strives to encourage the unity Christ gives to his people," says the introductory panel. "In her obedience to the Great Commission she has established three committees ... to encourage the whole church in her ministry to one another and her mission to reach the lost.... In order to promote the church's unity, the GA supports the ministries of these three program committees through Worldwide Outreach: the combined budget to which all congregations are asked to contribute.... Each year's GA approves a WWO budget based ... on the plans and needs of the three committees.... Your gifts to WWO and your prayers for the ministries and missionaries of the church help us work together to reach the lost of this world and strengthen Christ's church." Which committee does which work? That's not important. What's important is that great effort and millions of dollars are being expended by the whole church to do what Jesus told us to do in the Great Commission. But then, as you go deeper into exploring the whole work of the whole church, you'll find that this one brochure holds three others. A brochure from the Committee on Home Missions and Church Extension describes its work and opportunities for you to join in prayer to help find and train new church planters and to assist the presbyteries of the OPC with the challenging work of raising up new churches. Open it up and the brochure becomes a thrilling, pictorial map of North America introducing forty church planters and eight regional home missionaries. A brochure from the Committee on Foreign Missions details its objectives, profiles several mission fields, and introduces new opportunities for prayer. Open it up and the brochure becomes a joyful and informative pictorial map of the world. It lists our current nineteen missionary families and describes the ten mission fields in which the OPC labors, so that you can pray for each. 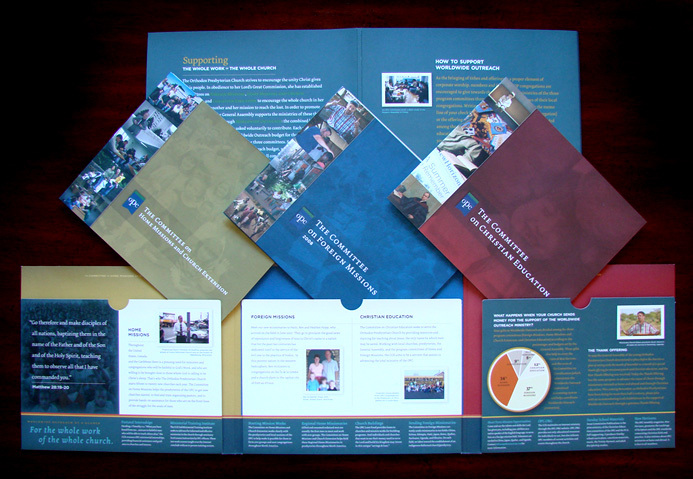 A brochure from the Committee on Christian Education reviews its history as well as the multi-faceted work of Great Commission implementation. Designed in booklet format, you can then tour the eight major aspects of its work, and rejoice as you discover all that God is doing through its work. On the back of each brochure and the WWO envelope itself is a description of how you can help. To support the work of Home Missions, Foreign Missions, and Christian Education, Orthodox Presbyterians give to Worldwide Outreach. "As the bringing of tithes and offerings is a proper element of corporate worship, members and friends of OP congregations are encouraged to give towards the support of the ministries of the three program committees through the budgetary processes of their local congregations." Why don't our foreign missionaries, church planters, and pastoral interns go out and raise their own support? Because they are involved in the work that has been decided on and paid for by the whole church! We send them out, pray for them, and provide for their support by our gifts to Worldwide Outreach—one work in many facets. 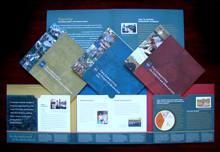 Within a few weeks the brochures will begin arriving in a Plexiglas display holder for your church's literature table. One brochure will also be provided for each family in your church. They will serve as excellent church bulletin board display maps of Foreign and Home Missions ministries. No refrigerator or home school classroom will want to be without them. And these materials will serve well for new member orientation. Why all the fuss and expense? Because God has bountifully blessed the OPC with significant Great Commission work throughout North America and around the world. The GA believes that the people of the OPC need the information in these materials to fully rejoice in all God is doing through them and their church and to effectively pray that he will continue to bless their Great Commission responsibilities. If you are not connected to a local OPC and are interested in receiving one of these packets, click here.